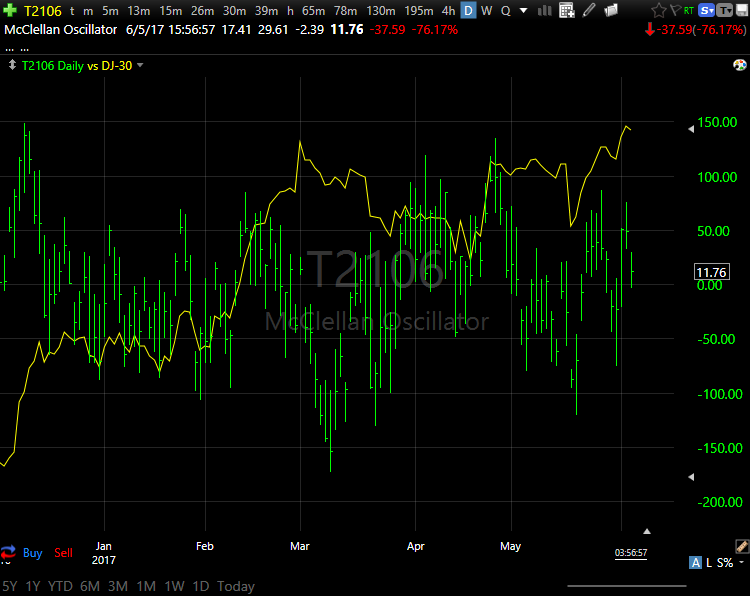 The McClellan Oscillator is reported each day by many financial news services. Their reported value will almost always be different than our value because, as mentioned earlier, we use every stock on the NYSE. The overall trend of the indicator, however, will be the same. The McClellan Oscillator is calculated by subtracting a 39 day exponential moving average (of advancing issues – declining issues) from a 19 day exponential moving average (of advancing issues – declining issues). It not only works as an overbought/oversold indicator, it works fairly well at making short-term trend changes when it crosses the zero line. This next section, beginning with T2107, covers T2s that count the number of stocks on the NYSE trading above or below their moving averages. When plotted against a market index such as the S&P 500 (SP-500) or the Russell 2000 (RUT-X), you can see how the market reacted when large numbers of stocks were trading above or below their moving averages and what patterns to look for in the future.